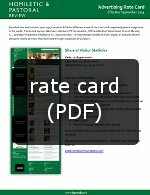 Please click here to view our current rate card (PDF). Interested parties should contact ads@carmelcommunications.com. Thank you.